Spit chana dal is soaked in water and ground into coarse mixture. It is then mixed with spices and onion and dropped into hot oil. Once chana dal fritters turn golden brown, remove from heat and serve immediately. 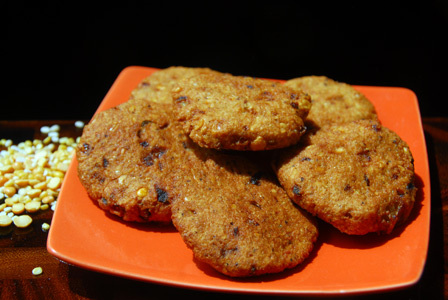 Makes: around 5 Chana Dal Fritters. Wash and soak chana dal in water for around 3 – 4 hours. Keep few tablespoons of soaked chana dal aside for later use. Strain and grind the soaked chana dal coarsely without adding any water. In a mixing bowl, mix together ground chana dal, reserved chana dal, onion, green chiles, ginger, cumin seeds, curry leaves and salt. Scoop up a lime sized portion of the above mixture onto palm and press slightly to form a disk. Carefully drop the chana dal disk into hot oil. Repeat the same to make more chana dal vada and drop into hot oil. Fry the chana dal vada till golden brown on all sides. Remove the chana dal vada onto absorbent paper. Repeat the procedure if there is any more chana dal mixture left. Serve chana dal fritters immediately. Notes: Make sure to fry the chana dal fritters well. Suggestions: Adjust spice with green chiles. If chana dal fritters are not cooked properly, drop them back into hot oil and fry again till done. 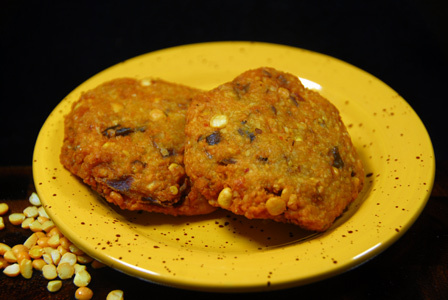 Variations: Check masala chana dal fritters here. Other Names: Chana Dal Fritters, Senagapappu Vadalu. Split chana dal is roasted till light golden in color. It is then ground into powder with spices. Finally grated coconut is ground along with the chana dal mixture into smooth paste and seasoned with dals. 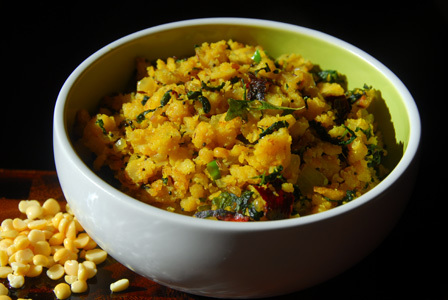 Serve chana dal coconut chutney with idli, dosa or with steamed rice and ghee. Makes: around 1 1/4 Cups of Chana Dal Coconut Chutney. Heat a heavy bottomed pan on low heat, add a drop of oil and chana dal. Roast the chana dal until it changes color and turns light golden in color. Remove the chana dal onto a plate. Add another drop of oil and add red chile. Fry for few seconds until it turns crisp and remove from heat. Cool the chana dal to room temperature and grind it into fine powder along with red chile and salt. Stir in grated coconut and half a cup of water and grind again into paste. Remove the ground chana dal coconut chutney onto a bowl. When mustard seeds start spluttering, remove from heat and add to above chutney bowl. 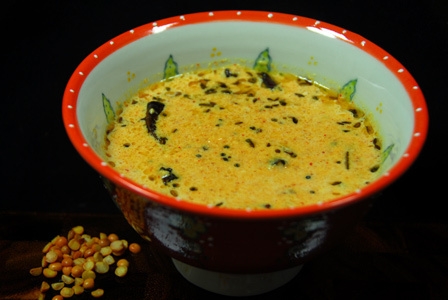 Stir well and serve chana dal coconut chutney with idli, dosa or with steamed rice and ghee. Notes: Make sure not to burn chana dal while roasting. 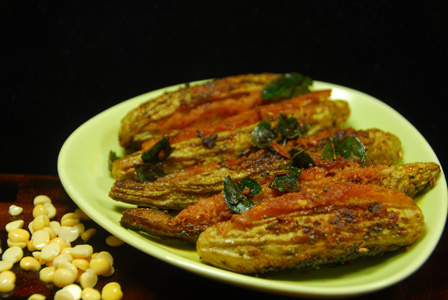 Variations: You can also add a clove of garlic while roasting chana dal and grind it along with coconut. Other Names: Chana Dal Coconut Chutney, Senagapappu Kobbari Pachadi.